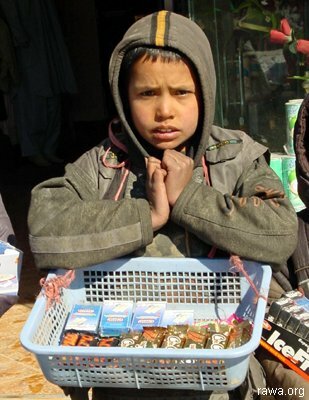 Trembling with cold, Shams, an 11-years old boy sales chewing gum in Shahr-e-Nou. He ears 30 Afghanis (around 60 cents) everyday which is price of 5 breads that is not enough for one time food of his family of 5. His father is disabled and can’t work, his mother washes cloths. His biggest wish is to go to school and become a doctor. He has never been to school yet.